The hospitality sector has the potential to contribute to the creation and sustainability of decent work and development. The United Nations Development Program recognizes that “representing 10% of world GDP, 1 in 10 jobs and 7% of global exports, tourism has a decisive role to play in the achievement of the 2030 Sustainable Development Agenda. The OECD recognizes tourism as one of the largest and fastest growing sectors in the world economy and the Sustainable Development Goals include the sector in Goal 8 on Decent Work and Economic Growth as well as Goals 12 and 14 on Responsible Consumption and Life Below Water. The ILO estimates the number of jobs in the sector to grow from 284 million worldwide in 2015 to 370 million worldwide by 2026. 20% of those workers are employed within multinational enterprises operating increasingly through brand identities using management contracts and franchising models. 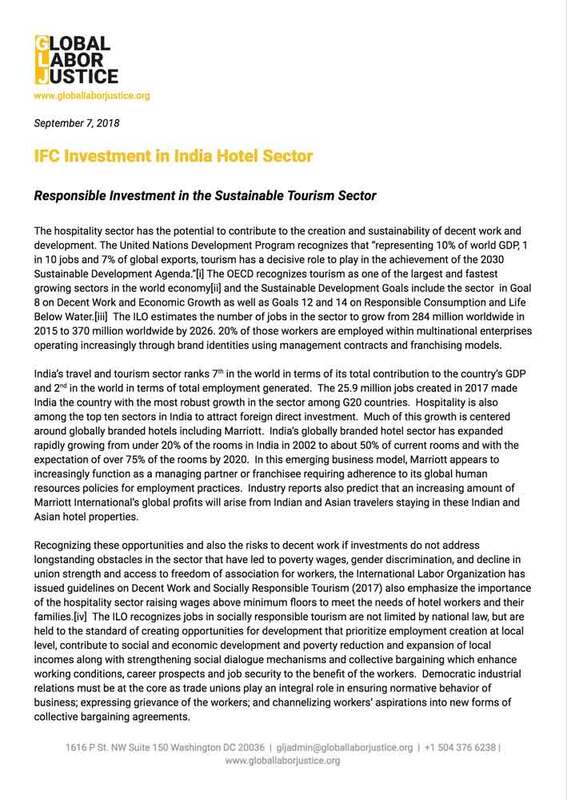 Recognizing these opportunities and also the risks to decent work if investments do not address longstanding obstacles in the sector that have led to poverty wages, gender discrimination, and decline in union strength and access to freedom of association for workers, the International Labor Organization has issued guidelines on Decent Work and Socially Responsible Tourism (2017) also emphasize the importance of the hospitality sector raising wages above minimum floors to meet the needs of hotel workers and their families. The ILO recognizes jobs in socially responsible tourism are not limited by national law, but are held to the standard of creating opportunities for development that prioritize employment creation at local level, contribute to social and economic development and poverty reduction and expansion of local incomes along with strengthening social dialogue mechanisms and collective bargaining which enhance working conditions, career prospects and job security to the benefit of the workers. Democratic industrial relations must be at the core as trade unions play an integral role in ensuring normative behavior of business; expressing grievance of the workers; and channelizing workers’ aspirations into new forms of collective bargaining agreements. 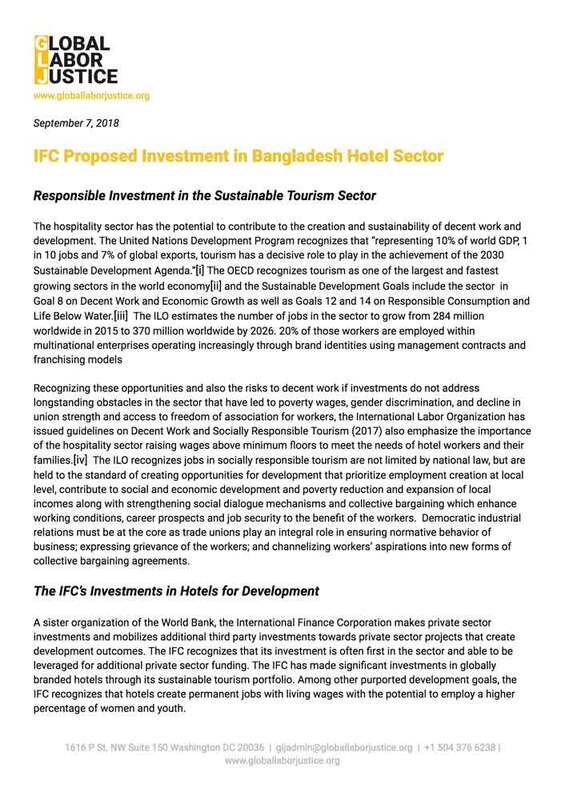 The IFC must ensure Performance Standard 2, Labor and Working Conditions in enforced consistent with this development for all, including decent work for all workers at the hotels benefiting from the loans.